Heat oven to 350°F (for all pans). Spray 60 mini muffin cups. Make cake batter as directed on box. Divide batter among 5 small bowls, about 3/4 cup each. Make 5 different colors of batter by adding 1/4 teaspoon food color to each bowl; blend well. Fill each muffin cup with 1 level measuring tablespoon batter, making 12 cupcakes of each color. Bake 11 to 14 minutes or until toothpick inserted in center comes out clean. Cool 5 minutes; remove from pan. Cool completely, about 10 minutes. In large bowl, beat marshmallow creme and butter with electric mixer on medium speed until blended. Beat in powdered sugar until fluffy. Divide frosting among 5 small bowls, about 1/3 cup each. Using the same 5 food colors, lightly tint frosting in each bowl to match cupcake colors. Assemble each popper using 2 mini cupcakes. Cut tops off each cupcake horizontally (save bottoms for another use). Spread or pipe about 1 tablespoon frosting on cut side of 1 cupcake top. Form a sandwich by placing cut side of second cupcake top on frosting; press lightly. Repeat with remaining cupcake tops. Store loosely covered. For a fun idea, using canned or leftover frosting, spread frosting between layers of cupcake bottoms and thread on wooden skewers. 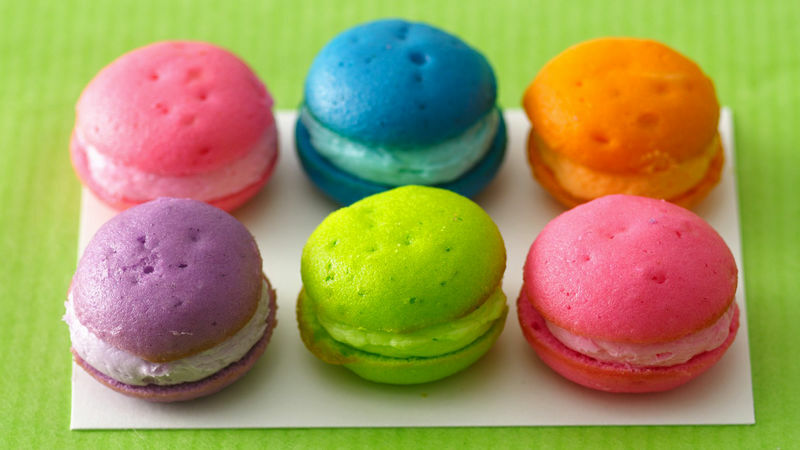 Is it a macaron? A whoopie pie? What are you making over there? That’s what we kept hearing when we were creating colorful Cupcake Poppers for the Betty 10 Holiday Trends project. We had way too much fun making these mini cupcake sandwiches- which was the whole point! See, Cupcake Poppers are the recipe we created for the Bright Color, Playful Food holiday trend. We were inspired by all the fun food that we’ve seen this year- things like cake and cookies on a stick, and desserts tinted every color of the rainbow. Go ahead. Get in the kitchen and play!